The Organisation for Economic Cooperation and Development (OECD) and the European Commission (EC) distinguish between three types of areas: cities or urban areas that are densely populated and where at least 50% of the population lives in the urban centre; intermediate density areas including suburbs and towns where less than 50% of the population live in rural areas and less than 50% in urban areas; and rural areas which are thinly populated areas where more than 50% of the population live in rural areas. 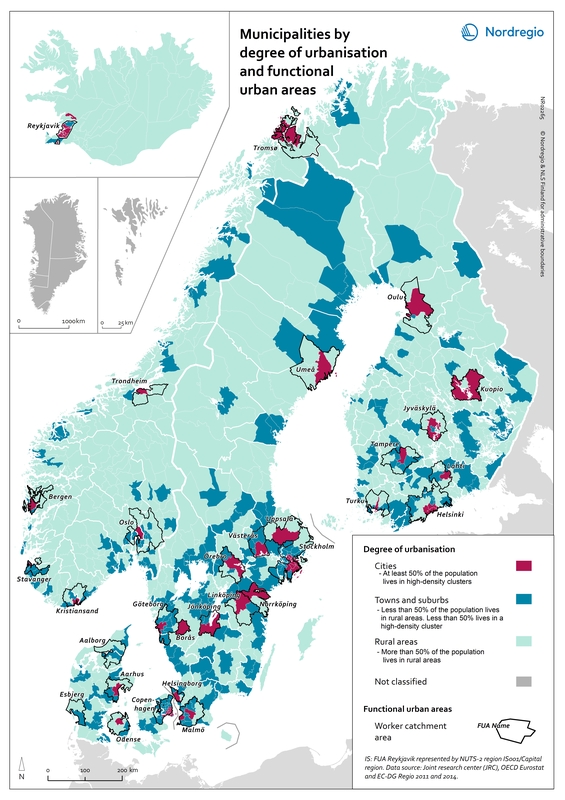 The core cities of the 31 urban functional areas in the Nordic Region, correspond with the cities as defined by degree of urbanisation. In the functional urban areas of Esbjerg and Aalborg, for instance, there are however no densely populated urban centres. The hinterlands in most functional urban areas in the Nordic region do include towns and suburbs as well as rural areas. The degree of urbanisation is a difficult concept to display but is useful as a way of adding nuance to the debate on urban-rural relations.